The Galaxy Note 8.0 follows closely a kind of design that emerged with the Galaxy S III, and was present in most subsequent Samsung phones as well as the Note II phablet. The corners are very curved, and the back is made of plastic, with the 5MP camera, which can shoot up to 1080p video, situated at the top center of the device. Like every other small tablet out there, the Galaxy Note 8.0 is clearly oriented for portrait mode usage. On the bottom there is the usual centered home button, and on either side of the button there are two capacitive buttons. On the top we have a Samsung logo, and above it are the 1.3MP front camera and some sensors. 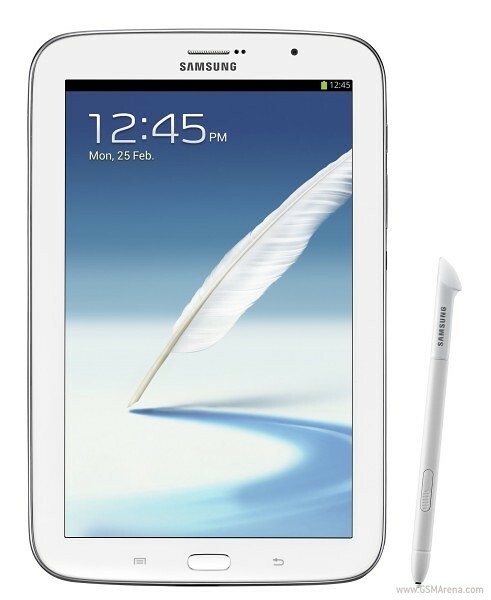 The Galaxy Note 8.0, much like every other member of the Note family, comes with a nifty S-Pen, a stylus which is an excellent alternative to touch input. The display of the Galaxy Note 8.0 isn't exactly breakthrough, but on a lower-price market like the 7-8" tablet market, the display isn't shabby at all. The 8" TFT display has a 1280 x 800 resolution, the same resolution found on the Nexus 7. The pixel density, therefore, is a nice 189ppi, which is between the 216ppi display of the Nexus 7 and the 163ppi of the iPad mini. Not shabby at all, like I said. In terms of performance, the Note 8.0 isn't a benchmark champion, nor does it boast particularly new technology, but still, it is much better than both the iPad mini, with its aged Apple A5 (32nm version) SoC, and the Nexus 7, which has an NVIDIA Tegra 3 processor, (and pretty much every other small tablet). The Note 8.0, in fact, comes with Samsung's very own Exynos 4412 processor, which boasts four ARM Cortex-A9 cores clocked at a high 1.6GHz, as well as a higher clocked Mali-400MP GPU. This is actually the very same chip found inside the Note II, therefore, the Note 8.0 should provide nearly identical performance to the Note II (especially because they both have the same resolution). The Note 10.1, which has a similar SoC, only with a 1.4GHz CPU, should also almost equal the Note 8.0 in terms of performance.